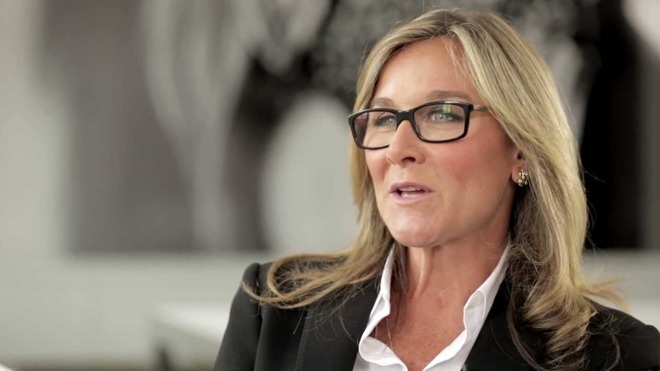 Apple head of retail Angela Ahrendts. Revealed in a series of U.S. Securities and Exchange Commission filings made public on Wednesday, retail chief Angela Ahrendts, CFO Luca Maestri and COO Jeff Williams each saw 130,528 RSUs convert into common Apple stock. The lode was worth $30.3 million at the end of trading today. Apple withheld 68,530 shares from the awards to satisfy tax laws. The bonus, meted out on a yearly basis, is derived from a target number of RSUs scheduled to vest based on Apple's total shareholder return relative to other companies in the S&P 500. This week's award accounted for TSR performance between Sept. 27, 2015 and Sept. 29, 2017. As detailed in the documents, TSR is calculated based on a change in AAPL share price during the three-year period. At the start date in 2015, Apple stock was valued at $113.15, while the ending value as of Sept. 29 was calculated to be $234.62, adjusting for dividends. The figures peg Apple's TSR at 107.36 percent for the observed period. In comparison to other companies in the S&P 500, Apple's performance ranked 51 out of 454 firms, putting it in the 89th percentile. As with past awards, the bonus structure allows for between 0 and 200 percent of the target number of RSUs to vest, depending on performance. Anything above the 85th percentile satisfies requirements for a full 200 percent award.